The Powderhorn Wilderness is a 62,050-acre (251.1 km2) wilderness area in Hinsdale and Gunnison Counties, Colorado, USA, located 5 miles (8.0 km) northeast of Lake City. 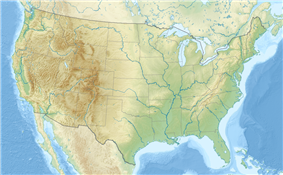 Most of the northern part of the area, 48,115 acres (194.71 km2), about 77.5%, is located on Bureau of Land Management land and its southern portion, 13,935 acres (56.39 km2), about 22.5%, is located within the Gunnison National Forest. The Powderhorn is an important watershed for the Gunnison River. The area protects the East, Middle, and West forks of Powderhorn Creek, which flows north directly to the Gunnison River. Calf Creek, which is on National Forest land flows south and eventually joins the Lake Fork River that also flows into the Gunnison via Lake City. Within the area there are numerous small lakes and beaver ponds. The largest of these are Devil's Lake and Powderhorn Lake. Much of the area sits above timberline at 12,000 feet (3,700 m) and it is recognized as one of the largest expanses of tundra in the continental United States. The lower portions of the area are characterized by large stands of ponderosa pine and groves of aspen and sagebrush. In the area's southwest corner is Cannibal Plateau where Alferd Packer and his party became lost in the winter of 1874. Packer ate his four companions to survive. ^ "Powderhorn Wilderness". Wilderness.net. Retrieved August 12, 2012. ^ "Powderhorn Wilderness Area". Colorado Wilderness. Retrieved August 12, 2012. ^ "Powderhorn Wilderness". Public Lands Information Center. Retrieved August 12, 2012. ^ Pearson, Mark (2001). Colorado's Canyon Country: A Guide to Hiking and Floating BLM Wildlands. Englewood, CO: Westcliffe Publishers.